I am trying to install your plugin and the installer aborts because of the following error. Can you advise me what I need to do? "ODBC source support will not be available. Unable to proceed due to the following errors." I am not a total novice but I am not sure what I need to do here. I can get Sphinx to install directly through SSH but it won't reference the plugin dashboard. Is there a solution for this? I installed sphinx through SSH and checked my usr/local/bin directory and I see both the indexer and searchd files in there. I also see in my etc folder sphinx.conf.dist and sphinx-min.conf.dist. A bit lost from here. I tried to put the paths in the manual indexer field and it failed. It recommended that I turn logging on but not sure how to do that on vanialla forums. Any help would be appreciated. Yes, put the location your indexer and serachd paths in the installer. Then paste your sphinx.conf.dist contents in the text box. What is the error message after you do this? May also try turning on all errors, error_reporting(E_ALL);, to see if 'open_basedir restriction is NOT in effect". Any advice? 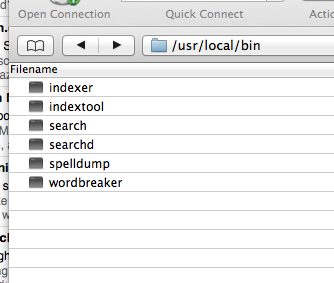 does the indexer exist in /usr/local/bin?? find out where indexer is located and point your path appropriately. Here is a screenshot of the file location. do you get help message. check your process list for the searchd daemon, is it even running? How do I check my process list? Here are two other lines of code that it is showing it cannot detect. it's not installed / configured correctly. it needs to have an indexer path and a searchd path. it didnt autodetect either of these (which to me means it's probably not installed correctly) you are using a manual path for searchd - verify there is a an executable at the location. you need to specify the indexer path. the manual override is set to false and there is no detected path. what type of os are you using and do you have access to the console. I am using Centos OS on a Linux server. I do have access to the console (terminal on mac) and ran the above command. Here is what it returned. Also, when I viewing my discussions yesterday, I had Sphinx "enabled" and it gave me the error below. I disable Sphinx and the error goes away. If I need to reinstall, how can I uninstall everything cleanly and reinstall from terminal? Thanks for your help. I am still a novice at managing my own server, although, I am learning how to manage it better. It these type of issues that confound me a bit. This is because searchd is not found running on your localhost on port 9312, so I'd expect that message if it didn't install correctly. What version of the plugin are you using? Sometimes I found that apache does not have read or write permissions outside of your www/http folder, so the plugin will throw a "Not Found" error even if it is there. Place a known file somewhere on your machine and paste its location into the indexer path and then test to see if indexer was found. I'll have to look at the code again, but it is also possible to bypass the whole "not found" checks. Plugin version from read me file. look in your dashboard or the source code. I'm running a bit of interference. but to do a primitive test to get and test sphinxsearch (software) on your centos machine. you could try downloading, testing outside of vanilla and any plugins. to determine what your problem is. you could download from site. then you could install the plugins. as far as uninstalling just disable startup of the daemons in your linux init routines on bootup. then run your uninstaller for the binary if centos has that. Wanted to check and let you know that I haven't yet had an opportunity to re-install Sphinx but will soon. Other projects have taken precedence. Thanks for the info above. I will let you know how it works and if it installs correctly this time.